← Picture of the Week ~ Fullsteam! Mother Of All Food Truck Rodeos This Sunday in Durham! 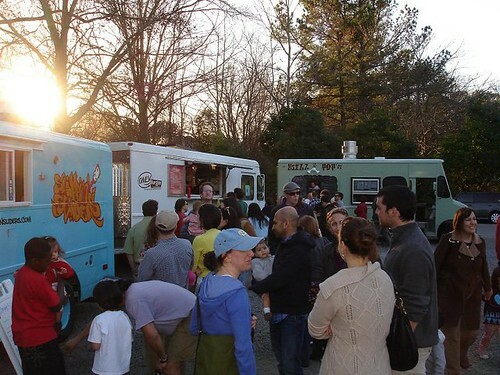 You’ve probably heard by now that the biggest food truck rodeo in the Triangle to date is scheduled to take place this Sunday in Durham. It appears it is being organized by the good folks at Only Burger and will include at least 17 other food trucks. The most trucks I’ve ever seen in one place is 7 or 8 so this is going to be huge! Bulkogi BBQ, Chirba Chirba Dumpling, Only Burger, Pie Pushers, Parlour, Daisy Cakes, Klausie’s Pizza, Will & Pops, Ko Kyu, Grilled Cheese Bus, Slippin Sliders, Farmhand Foods, Parlez Vous Crepe, Sweet N Savory, Dons Classic Ices, Crossroad Kettle Corn, Kona Chameleon Coffee, Kona Ice and possibly a few others! I suggest you get there early and avoid the lines. These events can get very crowded! See you there! dang it! Missed it 🙂 Must have been awesome! Carrie I think they are planning to do another massive roundup in the Fall. In the meantime there are usually mini roundups every few weeks during the summer and /fall. If you follow a few of the food trucks on facebook you can get regular updates on when these happen.